This is an easy, light and incredibly moist salmon cake recipe served with a spicy soy and tobanjan dipping sauce. 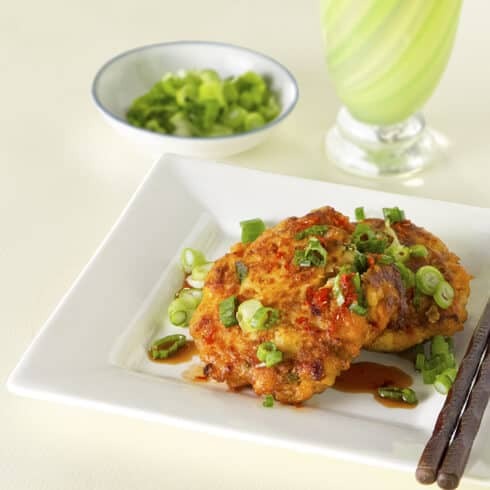 Salmon cake recipe served with a spicy soy chili sauce. This salmon cake recipe is something both my husband and I truly enjoy. What makes this even better is the fact that him liking it at all is a total anomaly. My husband doesn’t usually like salmon, yet considers this salmon cake recipe one of his all-time favorites. And I get where he’s coming from. While I truly love salmon, it is a fish that is on menus everywhere – and is often times underwhelming. His reaction to the first bite of this fluffy and flavorful salmon cake recipe was one of delicious surprise. I think the spicy dipping sauce was a big hit too! Making this salmon cake recipe is a great way to introduce fish into your diet (also perfect for kids) if you’re not normally a huge fan of it. These ginger flavored salmon cakes have fluffy mashed potatoes, soft onions, spicy jalapeno and ginger, and come with a very hot soy tobanjan (Korean chili paste) dipping sauce. I’m drooling just writing about them! It’s fair to say that this salmon cake recipe is now in heavy rotation in the Pickled Plum kitchen! Serve this salmon cake recipe as a side or a main with some easy vegetable rice, a ramen noodle coleslaw or a yakisoba spaghetti squash. Did you like this Salmon Cake Recipe? Are there changes you made that you would like to share? Share your tips and recommendations in the comments section below! Add potatoes to a pot filled with water and boil until cooked through (about 7-10 minutes). Drain, transfer potatoes to a bowl and mash using a potato masher or fork. Set aside and let cool to room temperature. In a pan over medium heat, add 1 tablespoon olive oil, jalapeno, garlic, onion and ginger. Cook for a few minutes until onions are soft (about 4 minutes). Put in a bowl and let cool to room temperature. Chop salmon into small pieces (like a tartare), add to the bowl with the potatoes (ONLY when potatoes have cooled down, otherwise the heat will cook the salmon). Add cooled onion and jalapeno mixture, egg and bread crumbs and mix well. Spoon some of the mixture into your hands and shape into patties about the size of your palm. Heat up the butter, olive oil until it bubbles and add patties (you may need to do this in batches. Do not overcrowd the pan). Cook each side for about 4 minutes, until patties are golden brown. Sprinkle scallions on top and serve with rice and soy dipping sauce. Put all the ingredients for the sauce into a bowl and mix well. Serve. You can store this salmon cake recipe in the fridge for 2-3 days. Just had to make these salmon cakes. AND WOW They are the best thing I’ve tasted in a long long time. THANK YOU DEAR LADY FOR SUCH A LOVELY RECIPE.